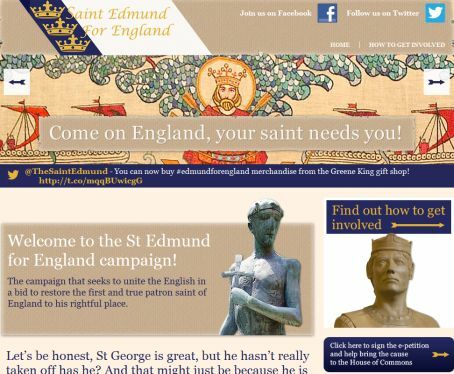 A group of newspapers have thrown their weight behind an unusual campaign to ditch George as the patron saint of England in favour of St Edmund. The East Anglian Daily Times, Ipswich Star and the Bury St Edmunds Mercury are calling on the government to oust St George and reinstate St Edmund, who was the first patron saint of England for nearly 500 years. It aims to collect enough signatures on a petition to generate a debate in Parliament on the issue and is calling for another Bank Holiday to be created on the Monday nearest St Edmund’s Day, which is on 20 November. The campaign has been led by brewing giant Greene King, which is based in Bury St Edmunds, and is also being backed by BBC Radio Suffolk. Mercury editor Russell Cook, who is also West Suffolk editor of the EADT, said there had been a positive response from readers after the Archant papers joined the campaign. He said: “A lot of people have contacted us about it. It is a good thing for us to get involved in. We are very hopeful that we will get it changed and St Edmund will become our patron saint instead of St George. “We think that St George is maybe not linked so closely with England as St Edmund is. St Edmund was made patron saint in 869 but was usurped by St George in 1350. The campaign highlights how Edmund was King of East Anglia and managed to hold off invading Vikings, while it is not known if St George actually visited England and he is patron saint of 17 countries around the world. Mark Blythman, Greene King strategy and communications director, told the EADT: “The St Edmund for England campaign is storming ahead nicely. “We have more than 500 likes and follows on social media, which just a few weeks into the campaign is a fantastic start. Our Greene King Brewery shop in Bury St Edmunds will very shortly start selling St Edmund for England mugs, T-shirts and car stickers. “We are rapidly approaching 2,000 signatures on the petition, but there is still a long way to go to generate a debate in Parliament. Further details about the campaign can be found here. saint of which other country ? Which day is he traditionally celebrated in England ? It’s a fluffy summer story for East Anglia but nothing more. Where is the online petition? otherwise known as an e-petition. I want to sign it now! lol Come back St Edmund. If my memory serves me correctly, Edmund didn’t have much success in “holding off the Vikings”. Alfred of Wessex did a much better job, but no one bothered to make him a saint.